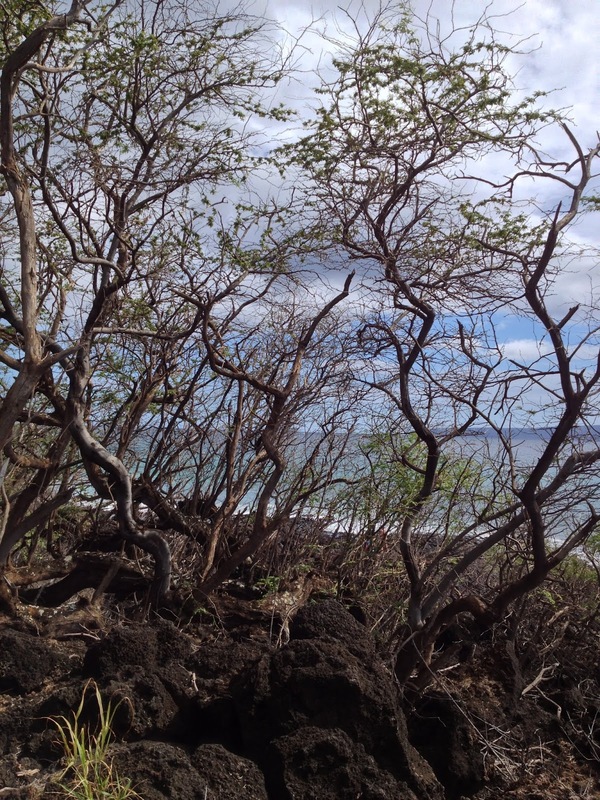 Intro: Back in 2011 or 2012, I wondered if kiawe, the thorny tree that grows on the dry side of most if not all the Hawaiian Islands, was edible and wrote a blog post exploring its edibility. 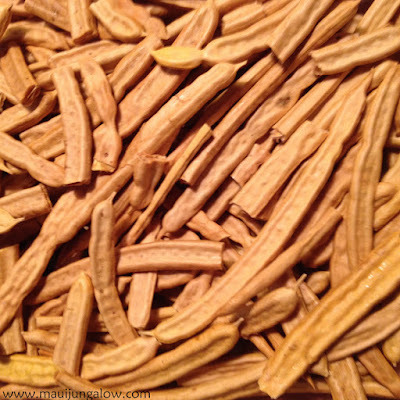 I was thinking it might be a form of mesquite, a desert tree in the southwest after reading about mesquite flour in Gary Paul Nabhan’s book Coming Home to Eat. Apparently mesquite is a very delicious flour. 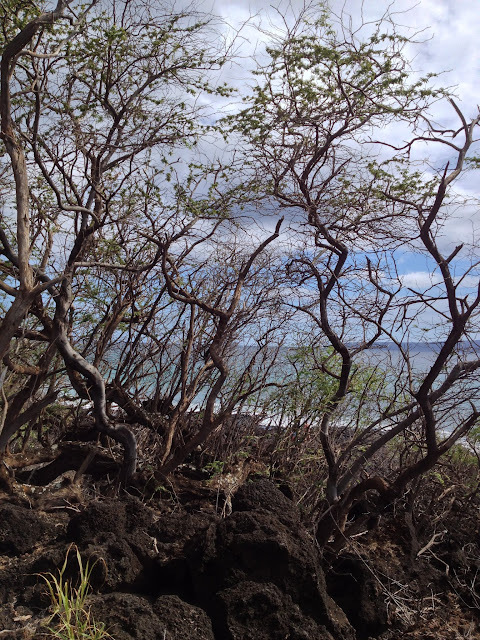 A thicket of kiawe trees. Interestingly, kiawe often twists and turns as it grows, even growing horizontally. Note: Kiawe is usually pronounced, "kee-AH-vay." It is also known as Algarroba in Spanish. Last year, I found out about a presentation at UH Maui college on eating and using kiawe flour, including making and sampling kiawe flour peanut butter bars. I was so disappointed that I couldn’t attend but excited to know that other people had explored kiawe as an edible wild food source and were even milling it commercially. They had a website: www.waianaegold.com with the belief that kiawe was a special food, valuable like gold, that Hawaii’s residents should learn about and use for their benefit so that it wouldn’t be exploited – like other aspects of Hawaii’s culture. 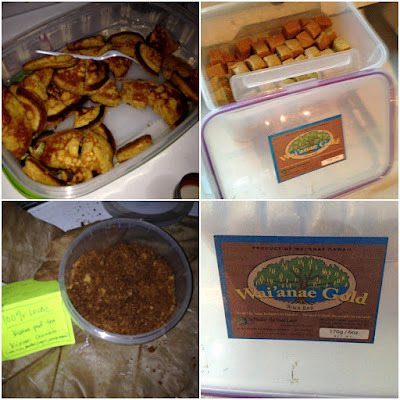 This year, I was thrilled to find out that Vince Dodge of Waianae Gold was coming to the monthly potluck meeting of HFUU Mauna Kahalawai, the newest Hawaii Farmers Union chapter on Maui, to do a presentation on foraging for and using kiawe as a wild food. Note: Waianae is a town on Oahu’s south shore. It is located on another island, which required Vince to fly to Maui. Kiawe has serious thorns, no kidding! In addition, kiawe is considered an invasive plant that has spread and overtaken large areas of the island, essentially a weed. So, to discover that kiawe has a sweet side and a beneficial side was a delightful surprise. Alika Atay, president of HFUU Mauna Kahalawai, told us that when he was growing up on Maui, they sometimes gathered the kiawe beans to feed the animals – the goats, the pigs, the cows – when the weather was really dry and there was no grass. The kids would be paid by the bucket for the kiawe they harvested. But no one ever ate the kiawe seed pods! It wasn’t considered fit for human consumption. 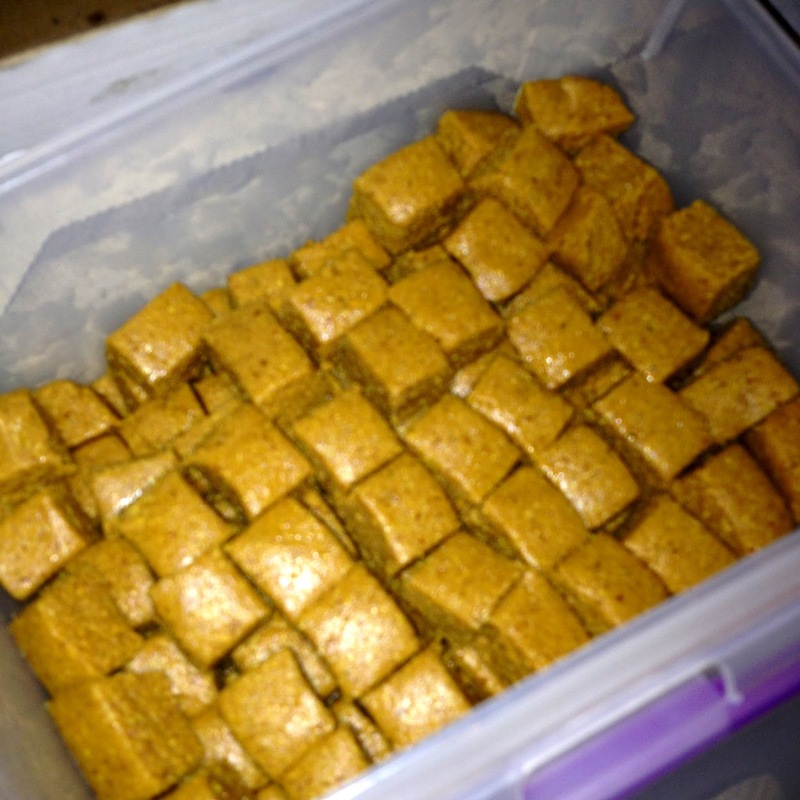 At the potluck table, there was a container of small honey colored squares. I took a couple and kept coming back for more. They were so ono – delicious! Sweet and kind of buttery flavored, with nuts. It was a kiawe flour energy square, made of kiawe beans and peanut butter. Kind of addictive, but actually really healthy for you. Organic raw honey but no sugar, and all whole ingredients. I was already hooked. A variety of foods made from kiawe flour: kiawe pancakes, kiawe energy power bars, aka 'aina bars, kiawe dessert crumble by Sunny Savage, and the Waianae Gold kiawe flour label. There was also a platter of kiawe pancakes, naturally sweet pancakes made with kiawe flour and a dessert of "Kiawe Crumble." 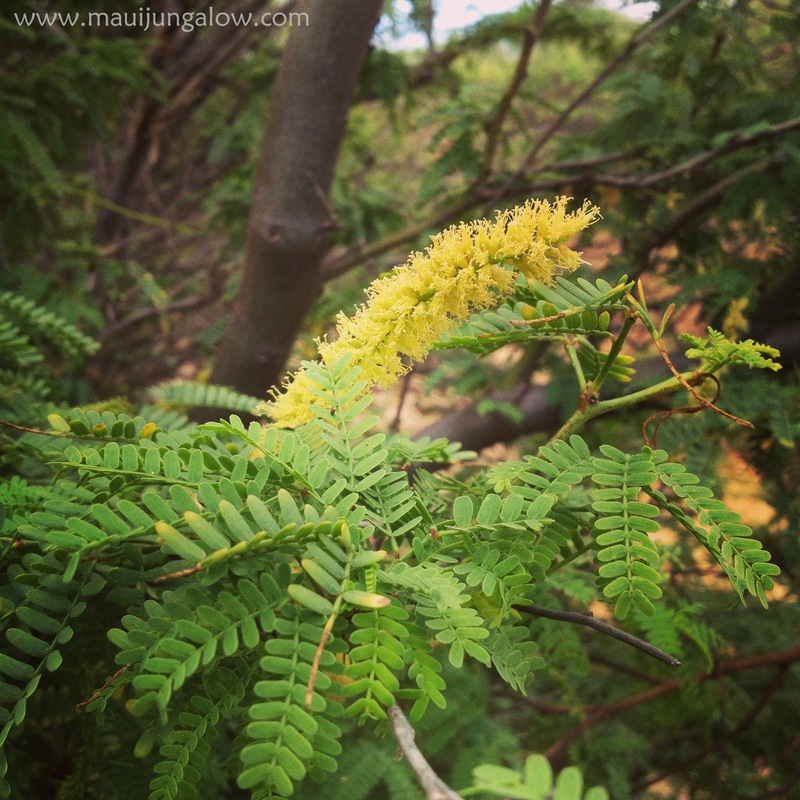 The kiawe flour has a sweet smell, not like flowers, more like a rich honey or molasses. 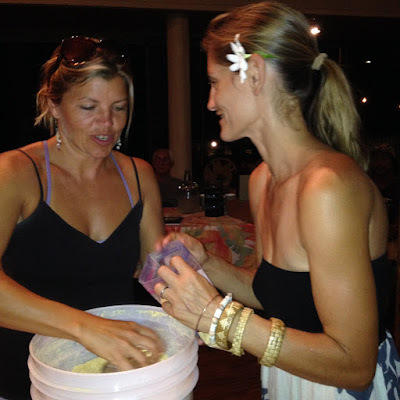 At the back of the meeting room, the Mill House at Maui Tropical Plantation, Autumn Rae and Sunny Savage were scooping this golden brown sand, it looked like coarse brown sugar, out of a big plastic bucket into individual bags. It wasn’t like scooping flour, it was like scraping out dried paint. The kiawe flour was sticky and reluctant to leave its plastic bucket. It required two people to manipulate the kiawe flour, and some arm muscles to bully it into those Ziploc bags. Autumn and Sunny are working out their arm muscles scooping the kiawe flour into bags. Meanwhile, at the front of the room, Vince Dodge was talking about kiawe and how he first learned that kiawe was edible. A visiting couple from Arizona noticed all these mesquite pods laying on the ground at Ma'o Farm and asked what Vince does with them. Vince said they didn’t do anything and the couple explained that these beans are edible and in Tucson, there is a big harvest of these mesquite pods each year. This conversation set Vince on a path to learn more about kiawe, that even took him to South America, and he has not been able to find this couple again to thank them. 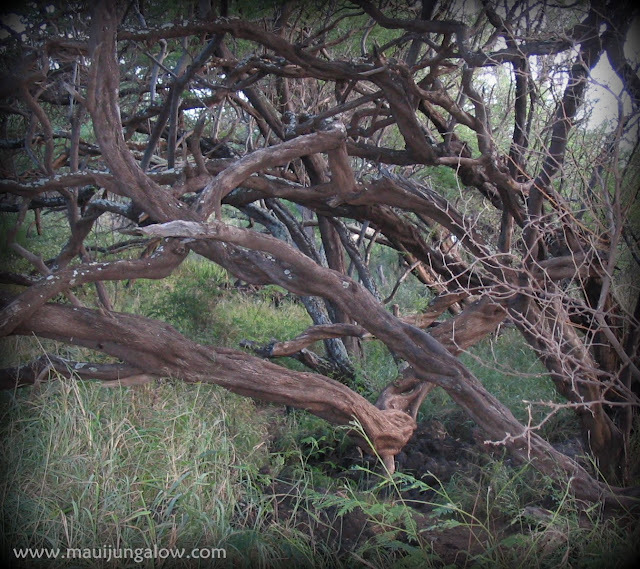 According to Vince, there are many different varieties of mesquite and our kiawe in Hawaii is a very sweet variety. We are lucky to have such a sweet tree. Kiawe is also gluten free and in his experience, a friendly food for diabetics. He has fed kiawe flour to diabetics and their glucose levels have remained stable, so he thinks it is one answer to a diabetic diet that limits most sweets. Specifically, friends with type I diabetes tested the 'aina power bars and verified that they were diabetic friendly foods. He began to search how to process and eat kiawe. He said he was looking for the original recipe for kiawe. How did people first start eating kiawe? He explains that his son had became very interested in poi and began looking for the “original recipe” for poi, meaning how it was made by native Hawaiians before modern technology or commercial food processing. He or his son came to the conclusion “you put the best on the board” and then you take everything off from the top but the starch and you have a very different food from what you find in the store that’s called poi. Wild kiawe growing in South Maui. Some trees are small, others are huge! Vince was saying there were different varieties of mesquite and our kiawe in Hawaii is very sweet. We are lucky to have such a sweet tree. Kiawe is gluten free and in his experience, ok for diabetics. He has fed kiawe flour to diabetics and their glucose levels have remained stable, so he thinks it is one answer to having a diabetic diet. What follows now is a transcript, verbatim as much as possible of Vince Dodge’s talk on his research into harvesting, processing and eating kiawe flour, with occasional notes by me. This presentation was given on May 21, 2015, at the public meeting of the HFUU Mauna Kahalawai chapter. I thought about rewriting it in a shortened form, but want to share the conversational style of Vince’s talk, without sharing the actual recording which has terrible sound quality. Please pardon any errors. I’ve listened to this recording over and over. I’ve added a few notes and headings in bold to make it easier to read. So having that experience w/ my son, I began to look around. We’re babies in this kiawe endeavor. We’re going online, we’re reading, we’re talking with guys in Arizona, they’re all babies too. What’s the original recipe? Can we please visit, can we just hang out with the guys who do this every day, who are like, ”This is our tree.”? Our request gets answered. In 2012, we spent the first 10 weeks in Argentina. We went to the very northern border of Argentina bordering Paraguay and Bolivia.. …river. we got to hang out with the Wichis, one of the largest indigenous groups in Argentina. Kiawe – they call it fwa'ai. Fwa'ai is one of their staples. This village I swear, was like trying to get to Ni’ihau [my note: an island in Hawaii that rarely allows visitors or modern technology, trying to preserve traditional Hawaiian practices] … like in the boonies of the boonies. The way the doors open. When things are meant to be, they just roll out. We were there with a family. The wife was Wichi. Like what M. was saying about where she was in Spain [my note: M went to Mondragon, Spain, as part of a HFUU initiative to learn about collectives and coops to help create this model on Maui], in this culture, the women choose their mates. We lived with their family, in their house. And they pounded by hand kiawe bean pods and they ate it raw. That was the primary, that was the original recipe. My deepest heartfelt thanks to all of them. We’ll be back to visit them sometime. They not only inspired, but they fed us in that way. This is a plant that for eons has been super valuable for them. John said please come back during harvest season. All the folks who’ve moved out to the towns come back. It’s the happiest time of the year because it’s such an abundant tree. It’s enough for birds, and animals and people. We gather and we gather and there’s more. But we came home and we eat lots of stuff raw, but we don’t eat flour raw. So what do you do? How do you incorporate this? We also pick up a mill, a beautiful little mill made by wonderful folks in Argentina for people who live in the country. The flour from that mill is a little bit gritty. So gritty flour, hmm, what do you do with gritty flour? Make an energy bar. I came late, sorry. Maybe we can pass it around. There’s kiawe bean pod flour and ground peanuts. Those bars are super simple, super easy to make. Recipe’s online. Actually there’s a video of me and our representative from Nanakuli, Andria Tupola, making them on her show. It’s like a gateway drug to kiawe. If you like peanut butter, it’s like you’re gone already. You can mix it with any other butter, taro and .. kuloom? kudum?… and other nuts. I’m sure there are lots of different varieties and you can come up with that. No sugar added, kiawe flour peanut butter energy power bites. Vince has given kiawe to diabetics without spiking their blood sugar. You know…for me, I’m called. That’s how it came about. In our community, we got the diabetic epidemic big time. We work with intermediate school students and we had 7th graders with type II diabetes. 11 year olds, 12 year olds. It’s like, we know, and I know you know this because you’re sitting in this room, we know there’s really huge things wrong with our food and our.. food system. This tree was introduced in 1828. That was the first documentation. It’s been hanging out for almost 200 years and its true nature, we are just scratching the surface now. It’s not just food, it’s medicine. Next time you step on a thorn, my friend Neil Logan turned me on to this, he lives in Kohala on the Big Island, chew the younger leaves, wherever the youngest leaves are on the ends of the branches. Make a poultice with that saliva and stick it on that poke. Kiawe thorns grow in all directions. DH, my dear husband, says that tank traps in WWII were based on the design of the kiawe thorns. Pain, infection, gone. It’s amazing. Cause it works on wana [My note: wana is a black sea urchin with long sharp spines. It's pronounced "vah-nah."]. Have you ever stepped on wana? You know, it’s painful, it’s sore. Kiawe poultice works. As I speak, there’s a sample in the lab in the University of AZ, biomedicine, bioscience department is looking to see what is the active ingredient. So they’re really curious about natural medicine. There’s a lot of information online about mesquite. Like poultices. This tree is like a coconut tree in the pacific. Like choke choke choke [my note: choke is Hawaiian pidgin for lots, meaning this tree produces a lot of food, like a coconut tree]… What else do I want to tell you? I want to invite you, come during kiawe season, if you want to do this, come. Our island is just starting. I just picked up 25 lbs this morning. I talked with Sunny and Autumn. It’s a little bit later here. Do I have enough time to go over some rudimentary? So we pick the beans up off the ground. In my yard, we hang nets to catch them. It works, but there’s wind, birds sh-t on them. We can’t hang nets down at the beaches, along the coast line and walk away. It’s ok to pick them up off the ground. The main thing about kiawe bean pods is if they get wet. If it’s a light rain, no problem, but if it’s a soaker then probably you gotta avoid the beans. Don't pick kiawe on a rainy day! If it’s dry, beans will be good on the ground for weeks and weeks, 4 – 6 – 8 weeks. They kind of look like French fries, kind of a dark color. Kiawe beans on the ground. We always talk to the tree, we always taste the beans, because not all trees, half the trees make bitter beans. Bitter is not bad, we just don’t know quite what to do with it yet. Because the taste in our community is sweet, we pick sweet beans. If you taste a few beans on a tree and they’re sweet, they’re all going to be sweet. Please break off or avoid beans that are moldy. What else? That’s the harvest, it’s pretty straightforward. … people who grow vegetables, your eyes are probably well-trained … and hey, you probably have a coolness (?) about food, I mean they put all kinds of stuff in fungus? It’s amazing. But that’s where the learning curve starts, right? We wash in a wheel barrow with a hose with a nozzle on it all those beans for about 10 or 15 seconds. Get them out of the water and shake them. Spread them out on black weed mat. We get them initially dry, get the water off and put them in covered solar dryers, super simple. You don’t need much money to do this. Black weed mat on platforms, with wire hoops and more black weed mat. It’s important to get the beans up to maybe 130, 140 in temperature. Because there is some documentation that says if you don’t do that, and you grind the seed in your grinding process, there is something in the seed that is upsetting to the digestive process. Once it heats up to 130 – 140, then there’s no problem. We haven’t had a problem with our flour. Our temperature gets up past 140 in our dryers. Q. How many beans do we get? A. You see that white bucket that Sunny and Autumn are scooping? That’s a 4 gallon bucket. You can get about 8 lbs in that bucket. Maybe I’ll interject right now. I was a fisherman, I’m growing taro, tapioca, bamboo right now, kiawe’s amazing. Because of the return. Q. Do you grind everything? A. Everything, the whole pod goes in. There’s one part that protects the seed. You have this exo part on the outside, this pulpy part, then these two shells that the seed stays in, those shells don’t grind. And the reason that we didn’t get the mill that the Desert Harvesters have in AZ is and we didn’t get any mill until we went to Argentina is because American made mills, they don’t know what to do with that part. This is the kiawe seed inside a "shell" that protects the seed. This is kiawe chaff. This is very tough to grind, and you wouldn't want to grind it anyhow. You want to dump or sift this from the rest of the flour. 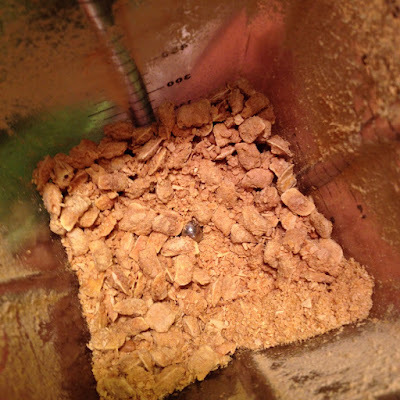 They end up filling your milling chamber or you have to break down your mill and empty it every 8-10 lbs. which is crazy because we mill hundreds of pounds at a time. So the Argentinean-designed mill actually pushes what we call the chaff back out. It’s a beautiful mill. Autumn Rae and Vince Dodge are scooping kiawe flour into bags. The drying process is key and in keeping the beans dry, it seems to be the difficulty that most folk who’ve tried this have. The kiawe will soak up moisture in 20 minutes. It’s hot all day, then it cools down in the evening. You can’t put hot beans away because they’ll give off moisture, right, as they cool. There’s this kind of window when they cool down enough and then you have to pack them in some kind of airtight container. It can be a cardboard box with a heavy duty garbage bag (we did that for a while), it can be 5 gallon buckets (food safe). I’m sure there are other things you can come up with. But that’s the key. Q.How do I know if they’re dry enough? Do I snap them? A. Great question. Snapping is good but we found the most accurate way is they snap and then when you bite a corner of the bean, it should powder like a cracker. If there’s some chew factor in it, it’s a little chewy, it’s going to be really difficult. We’ve done milling, we’ve done grinding in a Vitamix. I’ll just tell you that because there’s so much sweet in these beans, you cannot let the machine heat up. My friend Neil does it with a stainless steel meat grinder, same problem. My attempt grinding kiawe pods in a Vitamix. If it heats up it caramelizes the sugar. I’ve tried it in my poi machine, my taro poi machine, which is a grain grinder. It was good, as long as I was throwing one little piece at a time. As soon as I put in more, it smells beautiful and then that was it, the grinding was done. So the key to grinding is to keep the temperature cool and really you want to grind in the lowest humidity possible. Like an evening like tonight, no way – this will gum up so quickly. If we leave the flour out on the table and in 15-20 minutes, the flour will be sticky. It’s sticky on my fingers in 5 minutes. That’s kind of its nature, it wants to absorb moisture. That’s kind of the key there. Q. Is there any way to extract the sugar and use it as a sweetener? A. I heard some guys were making mesquite sugar, so the short answer is yes, but I don’t know. We want to use it as a whole food instead of taking it apart into its constituents. At least, at this point. Q. How about a stone mill? A. Any kind of bur or stone mill, it’s called stone grinding, as soon as it heats up or if your beans are not super dry, it’s gonna gum it up, it’s gonna caramelize and it’s gonna burn. So we use hammer mills. Q. What about hand grinding? A. So the Wichis pound by hand, mortar and pestle. If you want to see, we have a video of auntie pounding on the floor in her kitchen. At the Ka Waihona charter school in Nanakuli, the kids saw the video and wanted to grind by hand. In an air conditioned class room, with a 5 gallon bucket, with a sledge hammer, they pounded beans. It worked and we had to sift the flour afterwards. Kiawe flowers and a close up of the kiawe leaves. Q. How long is the harvest season? A. Good question. Super interesting. According to my friend Neil who’s a botanist who has done a lot of research, some trees give beans for 9 months. Usually, the last couple of years in Waianae, and it depends where you are, it depends on whether you’re on the beach or in the valley, it’s been like they really start dropping in late July and they’ve gone till maybe the very beginning of December. It’s like 3 to 4 months. Have a sample of the flour back there. Have a taste. You’ll notice it’s not super sweet. This is the December harvest. So as the days get shorter and cooler, the beans change. In hot summer, you get the bigger, fatter, sweeter beans. It’s a wild food, right? So it totally adapts to the environment. Q. So if we were picking 1000 lbs of beans, you would bring the mill over and do ‘em, yeah? A. Exactly, this is our offer to all the communities. You guys go pick beans…actually the best thing to do is to send someone over a few days to hang with us in Waianae. See what we do, come home, and work with this community and pick beans, and set up and dry beans. If you can get minimum 500 lbs, we’ll bring the mill over. We figure it’ll cost us about 200 lbs to make the trip over and spend a couple of days milling with you guys, make it worth your while. We can do about 500 lbs a day. So pick up 1000 lbs and we can do it. We have this food here. Right now our flour’s $12/lb in the farmers market. We don’t have any supply to wholesale to anybody. In fact we only sell to …..? market. Because they’ve been supporting us for a couple of years now. We just don’t have enough flour. Last season’s harvest was really thin because there was too much rain. The hotter and dryer, the better for kiawe. Q. Would it make any sense to cure them? Do you know what I mean by curing something? Would this even be curable? A. I’ll tell you 2 things about curing, I have dried beans and kept them for 2 years. The flavor of those beans was amazing. The sugars – it matures. The other thing I did was I took bitter beans and left them in my car for like 6 weeks, in a black bucket. I just drove everywhere rolled up my windows and picked beans everywhere. Then we milled bags of flour. It wasn’t sweet, but it wasn’t bitter. It changed. And I read that in an account by SW natives. I think they bury beans in the ground for like a month. Somebody else told me, this is Gary Nabhan who is a wonderful researcher and wild food expert, that ground hogs or some creature, they store the beans, they’re not smart, they just store only the sweet ones, and if you find their store house and you can share in them. This was sap that came off the trunk of a kiawe tree. It looks like amber, and was hard like resin. Any other questions? I really appreciate it. If you want to make donation for flour, it’s back there. Of course taste it, and call me with any questions. By the time I finished my recording and headed to the back to the room, Autumn Rae and Sunny were scooping the last of the sandy kiawe flour into the last of the Ziploc bags. I said I’d like to get a bag, but it was too late, they were all spoken for, and they had no more kiawe flour left. Enviously, I looked around to see some people holding two or three bags. Those greedy buggahs! Sunny shared some kiawe bean tea that she made. It was delicious and warming. It’s another way to enjoy kiawe without grinding the beans. It’s been months since that talk, since it was back in May, and I have been waiting and waiting for the kiawe pods on Maui to start dropping. In June?, I first noticed some kiawe flowers at the beach. Just a few. I wondered if we would even have kiawe beans this summer. And then just two weeks ago, I collected my first batch of kiawe seed pods. Kiawe is better known as kiawe honey. Bees gather kiawe pollen and make a delicious local honey. Now we know people can eat the beans too! 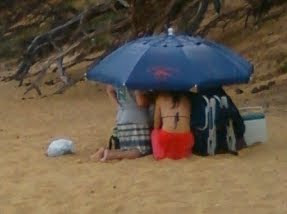 Other beaches on Maui, further north I think, have had kiawe seed pods earlier. 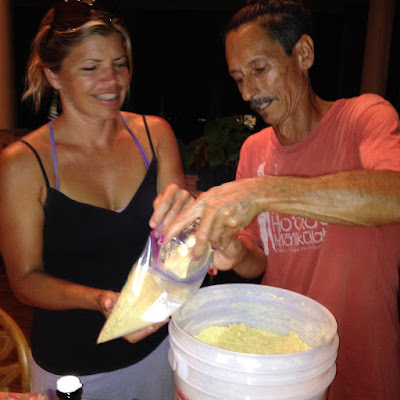 Sunny Savage has reported foraging for kiawe beans in July in West Maui. There is a Facebook event, called Kiawe Harvest 2015, which is dated July 2015, but is actually ongoing until the end of kiawe season. It’s a good place to find more information on harvesting kiawe, and you can ask questions. Sunny and Autumn are planning to host a kiawe milling event in the fall, when Maui participants have collected enough kiawe to mill, but details are still TBD. Another good source is Waianae Gold, Vince Dodge’s site on kiawe and also, A Kihei Garden Cuisine has a great post on kiawe as well. Visit the Archives for more posts and sign up for my monthly-ish newsletter if you would like to keep informed.